Comprising single-protocol (Din-Mon D2) and dual-protocol (Din-Mon D5) kWh/kW smart meters, Din-Mon™ products facilitate integration of energy monitoring into building automation systems and other space-constrained applications. Functionality enables facility managers to increase granularity of energy intelligence when monitoring building energy usage.Â Along with 4-line display, DIN rail-mount products feature 0.333 V output split-core current sensors and non-metallic enclosure. LANGHORNE, PA—E-Mon, the electric submetering market leader and manufacturer of the widely installed E-Mon D-Mon® product line, announces its new line of Din-Mon™ kWh / kW smart meters. 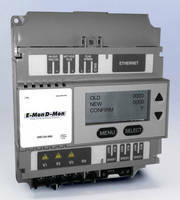 Housed in standard DIN rail-mount enclosures, the single-protocol (Din-Mon D2) and dual-protocol (Din-Mon D5) meters facilitate integration of advanced energy monitoring into building automation systems, switchgear, control panels, server racks, renewable energy systems and other space-constrained applications. Din-Mon smart meters meet or exceed national and international standards, including the Underwriters Laboratories (UL/CUL) listings for safety, the American National Standard Institute for accuracy and performance (ANSI C12.20), the European Union’s Measuring Instruments Directive (MID) that primarily addresses precision, reliability and security and CE Marking which addresses safety, health and environmental requirements.